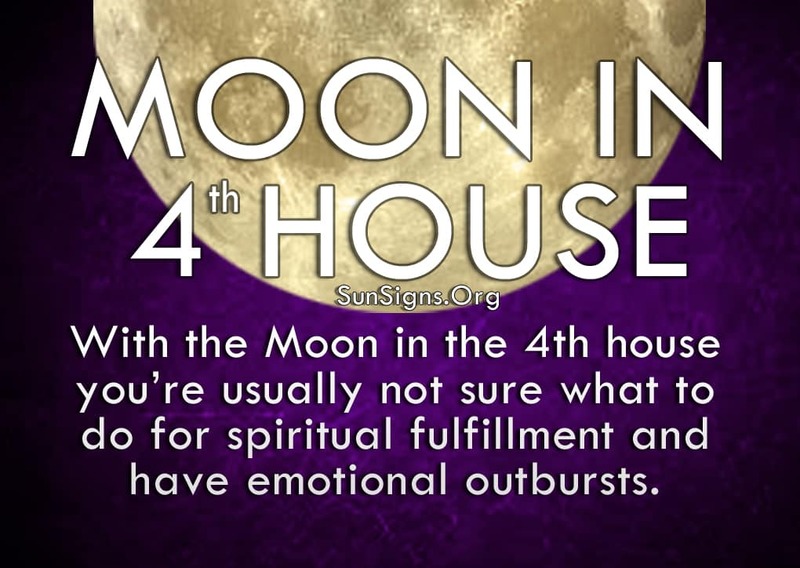 In astrology, the Moon symbolizes your emotional growth and well-being, but with the Moon in the 4th house, you’re usually not sure what to do for spiritual fulfillment. You often feel restless and have emotional outbursts, which don’t help you to feel settled in any way. Change is both desired and feared. When you are constantly searching for a place to feel content and settled, it may mean you are changing locations before giving anyone place a fair chance. Sometimes you confuse the excitement of a new place and new experiences with a feeling of satisfaction. Because that feeling of stimulation doesn’t stay with you for long, you feel you’re in the wrong place and that it’s time to move onto something else. And this doesn’t have to be location either – you often want to change your routine or your lifestyle to try and find that perfect situation. Trouble is, there is no such thing as a “perfect” anything. Instead of looking for people, places and things to satisfy your restlessness, people with the moon in the 4th house in their birth chart, should try looking within to fix yourself first. Figure out what you want to be happy to start, then look for concrete ways to obtain it. As you get older you have more responsibilities and more problems to deal with, so it feels like things are only getting worse. The better thing for people with moon in fourth house in their horoscope to do would be to slow down, take a deep breath, and prioritize your workload. Trying to do everything at once only adds to your stress. You need to take time for yourself, so you can recharge the batteries as they say. Once you have a fresh perspective on things, you won’t be eager to change them and try something completely different. Step into a routine, and spice it up when you feel you are falling into a rut. The routine will offer you stability, while the spontaneous events once in a while will bring in a feeling of fun and excitement. The toughest thing for people to do with the moon in 4th house will be to leave the past behind. Remembering the good times and looking at old photos and mementos is healthy, but don’t let it take over where you are now. It’s easy to fall back into old habits, especially when you’re most comfortable with how things used to be. Learn from past mistakes, and move on to enjoy the here and now. While you yearn for the days when you were younger and more carefree, you now have a greater knowledge of how the world works. Use it to your advantage.